The Cross is carved from 4 blocks of red sandstone. It measures 5.7 m high, and 1.07 m at the arms. The shaft is 58 cm wide and 36 cm thick. The base has two steps . East face. Shaft. E1 Adam and Eve knowing their nakedness. Old Testament . Book of Genesis. S2 David slays the lion. Type 1 David on lion's back. Old Testament 1 Samuel 17.34. W1 Adoration of Magi. Type 1 Magi around the Blessed Virgin Mary. New Testament. 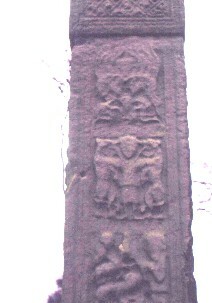 Further detail of east face of the cross face of the sandstone cross at Arboe. This top panel E4, depicts the three children in the fiery furnace. The three children are depicted protected by the outstretched wings of an angel. Flames lick up beyond the frame on either side of the angel's head.